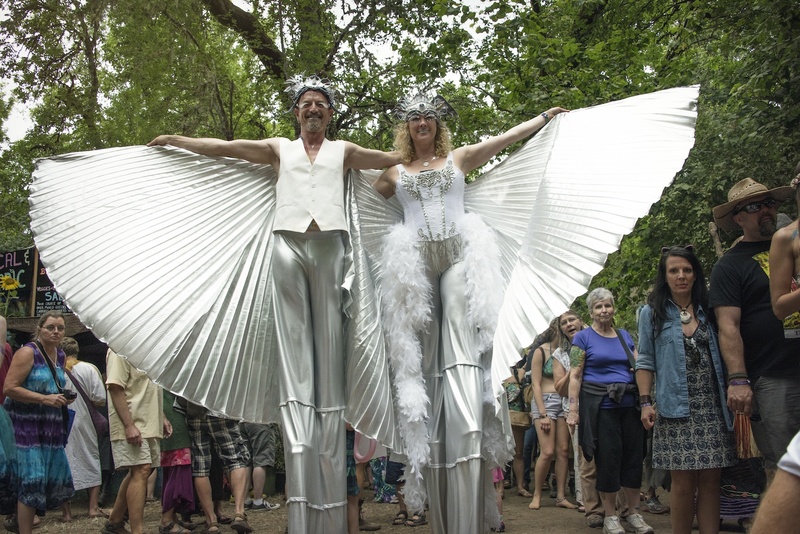 When people talk about the Oregon Country Fair , the words “Fair Magic” often come up. Where can we find it? Can it be bought at a booth? Or is it found in the woods and fields of the fair, a land so steeped, dipped, and soaked with history and magic, that it acts as a frenzied contagion spreading through the attendees? I began my journey to Oregon’s beautiful Willamette Valley to learn more about the concept of the Oregon Country Fair and "Fair Magic" to see if I could experience some for myself. 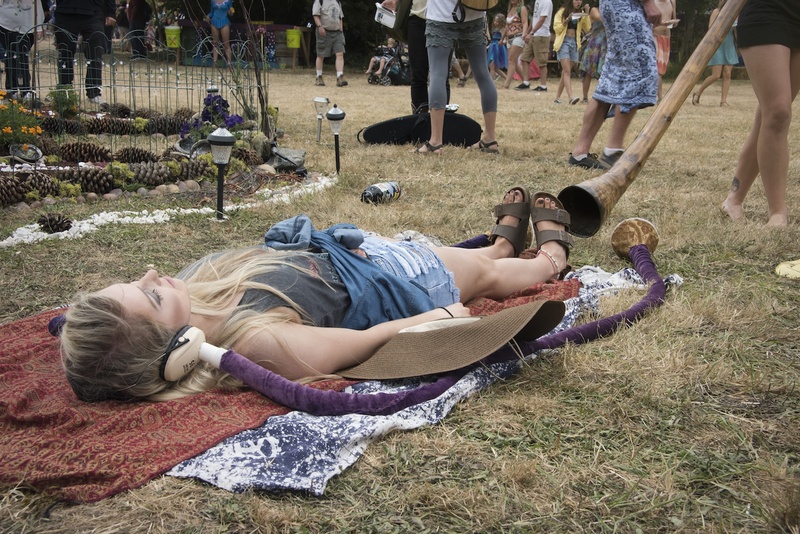 The Oregon Country Fair (OCF) is a non-profit organization and an annual, three-day event that takes place the second week of July on the outskirts of Veneta, Oregon. Originally starting as a crafts fair in 1969, the OCF is rich in counterculture history (it has hosted legendary bands such as The Grateful Dead). But lest you think the spirit of the original event was shed decades ago, you'd be mistaken. That spark is still very much alive today in its perfect blend of music, crafts, and entertainment, protected by the people who work hard all year to make this one-of-a-kind event happen. 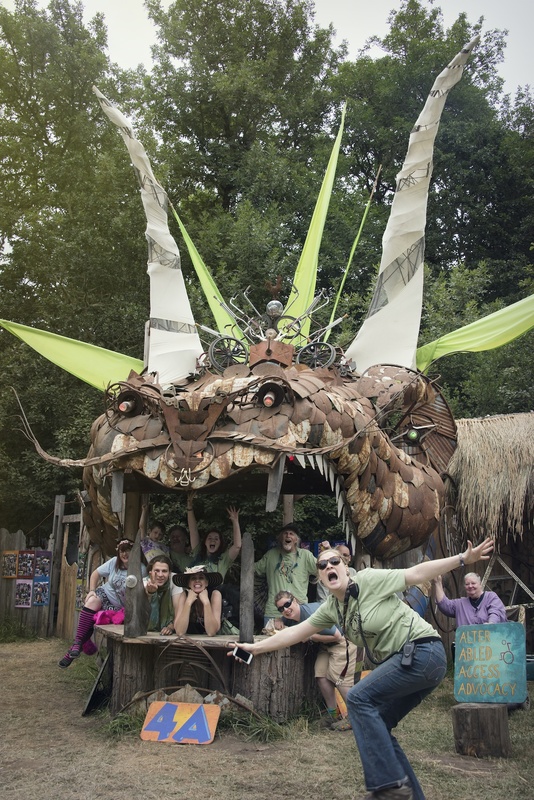 At the fair entrance located next to the head of a giant dragon, visitors are greeted by the friendly and helpful staff. The OCF has an amazing reputation of hiring and training some of the best event staff I have engaged with at any event. I patiently waited in line next to fairies, families, and children decorated with painted faces and expressions of excitement. Moving with the crowd, I found myself surrounded by distant beats and smells pulling me gently forward, serving as my guide along the paths of the fair. 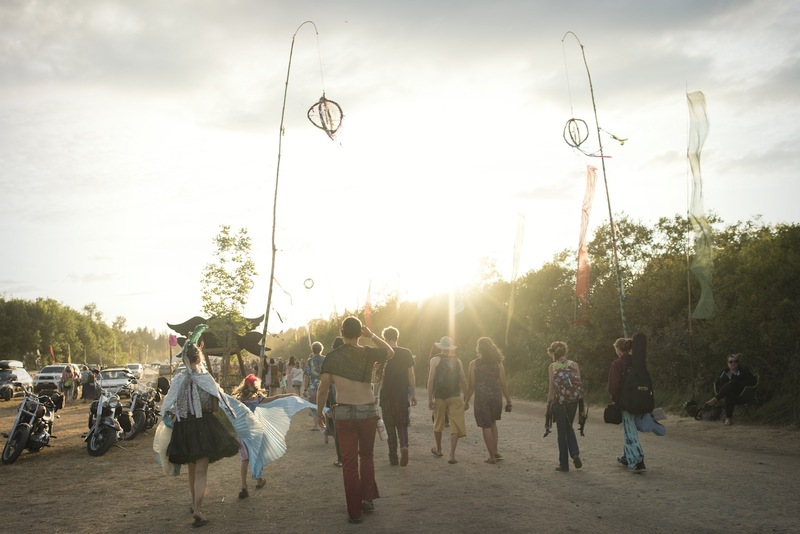 The woods appeared as a magical village, a bustling community of beautiful gypsies moving amidst the 280 acres where OCF takes place. There were 19 stages performing music, vaudeville, comedy, juggling, spoken word, theatre and everything in between, providing an incredible amount of entertainment. Lined along the looping paths were over 350 booths featuring more than 900 juried artisans and with 80 gourmet food booths creating a massive bazaar full of handmade items. Although I had a fest schedule in hand, I was neither in a hurry to get to one place or the other. Instead, I found myself relaxing and smiling as I set out to explore. OCF attendees are encouraged to wear costumes, and costumes were everywhere I went. Spread though the woods were parades of dancing clowns, life-size yard gnomes posing in fields, Ent-style trees slowly moving on stilts, children in butterfly wings soaring though open fields fluttering between the adults. Men donned robes, rabbit masks, or just body paint while women wore pasties, sometimes leaving little to the imagination. Modesty was slightly abandoned, making the vibe carefree and casual, leaving skin and soul in the open, and shedding layers the of the outside world like an onion. I overhead one patron laughingly explain that he had just seen his real-world boss in drag, donning a skin tight dress and knee high platform boots. Attendees interacted with art installations in new areas of OCF. A new dance and movement program, complete with dance lessons, led people happily across a beautiful dance floor. Interactive auditory terrarium pods that resembled mammoth onions housed groups of people creating their own shared musical experience together. Fair-goers lay on blankets next to groups practicing hula hooping, playing didgeridoo, and singing. The high level of interactive participation makes people-watching as interesting as anything else you may do at OCF and becomes the one big backdrop for the whole show. The path through Chela Mela Meadow was filled with crowds of jugglers. 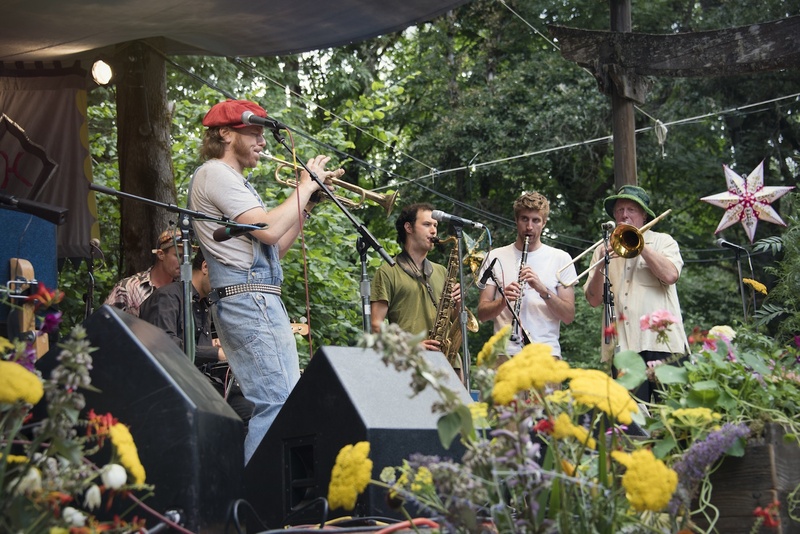 Pins and balls were tossed and spun back and forth, while under a tent, trumpet music lent the atmosphere and energy of an counter culture circus. Couples with bright wigs held hands and ate ice cream while watching the crowd. A woman on stilts walked by smiling and spread her silver wings, as teens practiced poi balls in rhythm. Bubble blowers waved wands and gave life to multi-shaped bubbles flying in all directions. A man dressed up as a squirrel ran by asking me if I had any extra nuts and when I explained I didn’t, he then started juggling three large nuts he kept in a pouch to the laughter and amusement of the crowd. Headline entertainers such as Beats Antique and The California Honeydrops added an extra layer of excitement and gave truly amazing performances. 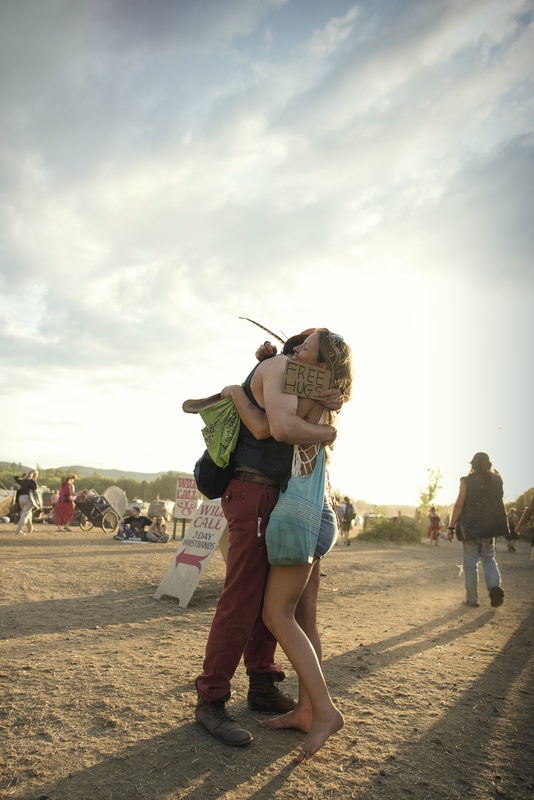 Love and energy seemed to pour from everywhere. Folks wore genuine smiles and held signs offering “Free Hugs” which didn't seem to be a ruse, but rather truthful and appreciated. Like Alice in Wonderland, we all fell down the rabbit hole and ended up at the same place. 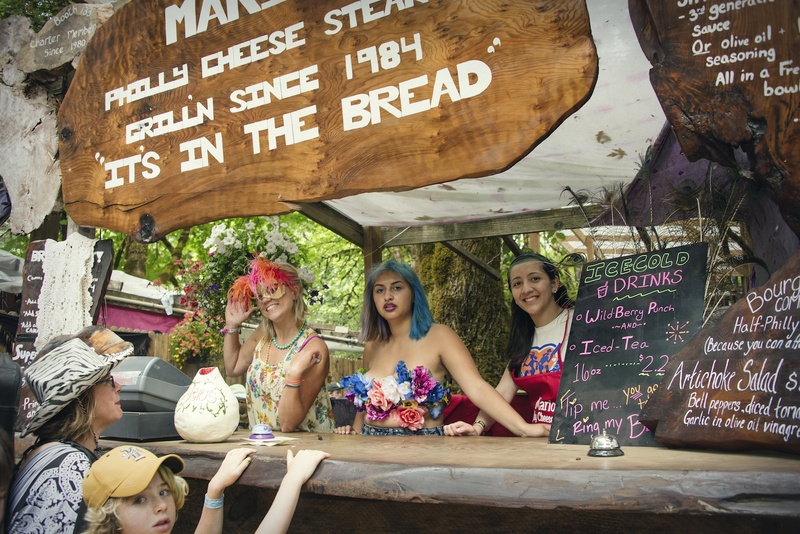 It wasn't hard to find magic at the Oregon Country Fair, because the Oregon Country Fair is magic.